How to Make Date Caramel Sauce | Healthy, Vegan, Only 4 Ingredients! This 4-ingredient Healthy Date Caramel Sauce is so silky smooth, creamy, rich, and sweet (everything you’d ever expect from caramel), that you’d never know it’s vegan, dairy free, paleo, and low fat with zero sugar added! If you’ve ever wondered how to make Caramel Sauce out of DATES, look no further! WARNING. THE FOLLOWING CONTAINS GRAPHIC IMAGES OF THE CREAMIEST, DREAMIEST DATE CARAMEL SAUCE BEING POURED SEDUCTIVELY INTO A JAR. To my surprise, though, it worked! Not only did it work, but it worked damn well. 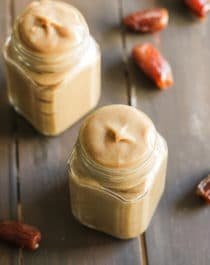 I could eat this Healthy Date Caramel Sauce by the spoonful. I just want to pour it in my mouth. This Healthy Homemade Date Caramel Sauce is super smooth, sweet, and FULL of caramel flavor. It’s certainly one creamy, dreamy, heavenly concoction. And best of all, it’s refined sugar free, low fat, vegan, and doesn’t require any cooking whatsoever! 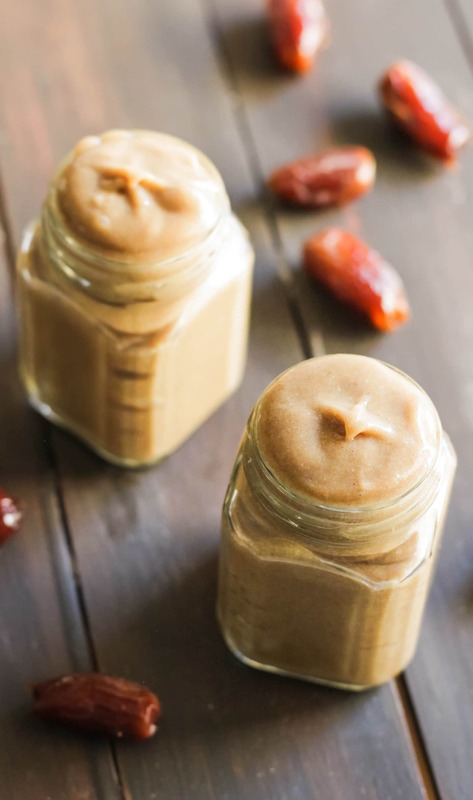 This 4-ingredient Healthy Date Caramel Sauce is so silky smooth, creamy, rich, and sweet (everything you'd ever expect from caramel), that you'd never know it's vegan, dairy free, paleo, and low fat with zero sugar added! In a heatproof bowl, add the dates and pour the boiling water on top. Let soak for 45 minutes. Reserve 1 cup of the soaking liquid and drain the rest. In a high-speed blender (I used my NutriBullet. A Vitamix would work too! ), add the soaked dates and ½ cup of the reserved liquid. Puree until smooth, adding more water as needed. In total, I needed ~¾ cup. Add the coconut milk, vanilla extract, caramel flavor, and salt, and puree until very smooth. Pour into a jar, seal tightly, and refrigerate to store. Keeps for ~2 weeks. **If you don't want to use this, I suppose you can use more vanilla instead. You just won't have as strong of a caramel flavor as I got. You gotta make this Date Caramel Sauce. No mega loads of sugar here, only pure and natural, wholesome goodness that you can feel good about! Dress up your favorite drinks and whisk this into hot coffee or hot chocolate. Smear some on a warm muffin or slice of toast. Swirl this goodness in yogurt or oatmeal. Maybe douse your ice cream with it too. Had to laugh when I read that it will keep for 2 weeks. There’s no way this wouldn’t be eaten the day it’s made. Thanks for sharing this great recipe! Hi, just wondering if you used medjool dates? Or just pitted dates? Thanks!! I don’t remember what kind of dates I used, but as long as they’re soft and not dry or rock hard, they’ll work! I have medjool dates do you soak then take off outer skin and seeds?